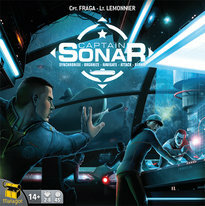 Captain Sonar is an innovative real-time game that challenges two teams to take their submarines head-to-head in a thrilling battle. Your ultimate goal is to find and destroy your opponent�s submarine, but this task is far more difficult that it may first appear. Your entire crew must work together to chart a course, charge systems, locate the enemy, and keep your own submarine fully operational. Communication and teamwork can lead you to victory, but if you fail to cooperate, you�ll be sunk to the bottom of the ocean! In Captain Sonar, you and your teammates control a state-of-the-art submarine and are trying to locate an enemy submarine in order to blow it out of the water before they can do the same to you. Every role is important, and the confrontation is merciless. Be organised and communicate because a captain is nothing without his crew: the Chief Mate, the Radio Operator, and the Engineer. All the members of a team sit on one side of the table, and they each take a particular role on the submarine, with the division of labour for these roles being dependent on the number of players in the game: One player might be the captain, who is responsible for moving the submarine and announcing some details of this movement; another player is manning the sonar in order to listen to the opposing captain's orders and try to decipher where that sub might be in the water; a third player might be working in the munitions room to prepare torpedoes, mines and other devices that will allow for combat. Captain Sonar can be played in two modes: turn-by-turn or simultaneous. In the latter set-up, all the members of a team take their actions simultaneously while trying to track what the opponents are doing, too. When a captain is ready to launch an attack, the action pauses for a moment to see whether a hit has been recorded, then play resumes with the target having snuck away while the attacker paused or with bits of metal now scattered across the ocean floor.